With the “Beckett Trilogy”, Irish actor Lisa Dwan gathers together three of Samuel Beckett’s monologues written in English for a female performer and plays them back to back without intermission. Though other projects intervened in the writing of these three works, the three form a fascinating sequence and seem to develop in form and ideas from play to play. Dwan has already won worldwide acclaim for her performance of these incredible difficult works and we are lucky that Canadian Stage has been able to bring the “Beckett Trilogy” to Toronto so that we can see what are likely the definitive performances of these pieces in our time. The evening begins with Not I (1972) followed by Footfalls (1976) and Rockaby (1981). The total running time for all three is 59 minutes, but the three are each such intense experiences one would hardly want more. For Not I, the most technically difficult of the three, the auditorium is made pitch black. Even the exit signs are covered. The darkness is essential because all Beckett wants us to see on stage is a woman’s mouth (known as “Mouth”) speaking a rapid, uninterrupted stream of words. Beckett said that the piece must be spoken as quickly as possible – “at the speed of thought”, in his own words. Billie Whitelaw, whom Beckett coached himself, delivered the work in 14 1/2 minutes. Dwan, who in turn was coached by Whitelaw, delivers it in an incredible 9 minutes and 50 seconds. This faster speed may be even closer to what Beckett wanted, but it brings with it a very practical difficulty. Dwan may be able to speak the words that quickly but we cannot possibly understand them that quickly. I, who have previous taught the piece at university, got very little out of Dwan’s performance except for the fairly frightening image of a disembodied mouth spewing forth a nearly unprocessable stream of words. If I, who already know the text well, gathered little from its performance, I can’t imagine what those unfamiliar with it could glean. Judging only from what I heard, rather than what I know, I had to rely on Mouth’s repetitions to make any sense of what she was saying. Mouth makes fun of her age as coming up to seventy rather than sixty. We can tell she has a dim view of religion given the long, witchlike laugh she makes between the words “merciful” and “god”. We can tell she is pained by a continual “buzzing’ in her head. Most important for this play and the ones that follow, we can tell that Mouth is telling a story, nominally about someone else, except that she periodically feels the need to emphasize the point that the story is not about her (hence the title). Five times we hear the sequence “what? . . who? . . no! . . she!” In Dwan’s performance the word “she” is an infuriated scream as if Mouth had suddenly thought her story would be mistaken as her own. It’s useless to go into all the aspects of the text that are missed by Dwan’s rush for the Olympic medal in speed-speaking. I realize that many perversely grant almost godlike status to any of Beckett’s pronouncements, yet in this case I must say I have found slower performances of the text (such as Barbara Gordon’s in 2004) much more effective. The key is not so much to give the impression of rapidity as that of unstoppability, as if a dam of silence had suddenly broken and all the pent-up words behind it finally come pouring out.
. It has four sections, each signalled by the ringing of a bell. In the first three sections we see a woman in a nightgown slowly pacing a lit rectangle of the stage exactly nine steps each way. We learn the woman’s name is May when she speaks with an off-stage voice who is her invalid mother (also voiced by Dwan). May offers to help her mother but her mother replies each time that it is “too soon”. In the second section May now speaks as her own mother and tells us that May has been pacing after some unnamed event and has never left the house since. In the third section May speaks as herself and, like the Mouth in Not I, tells a story supposedly not about herself, except that the main character is a girl named Amy, an anagram of May. In this pseudo-Victorian story Amy and her mother debate whether Amy was or was not at church at evensong. Amy insists she was not. In the fourth section the rectangle lights up but no one is there. The mystery, of course, concerns what we have actually witnessed. Is May’s mother really there or in her imagination? Or, as in the second section, is it the other way around? Or, as in the third section, are they both fictions, which their absence in the fourth section would seem to bear out? Footfalls is the closest Beckett comes to writing a play in the style of the noh plays of Japan, which he would have known through W.B. Yeats’s interest in them and Yeats’s imitations of them. Here as in noh, we have the impression of seeing ghosts reenacting past events, though Beckett adds the twist that the past events are not known nor who exactly the ghosts are. By the end we feel we’ve seen the after-image of a life just before it disappears into nothingness. Lisa Dwan’s performance is extraordinary. As May her voice grows more frail as she she seems to be weighed down by whatever past event obsesses her. Her mother’s voice, completely distinct, seems weighed down with care. Yet, in her story Amy’s voice is very like May’s but more lighthearted while the mother’s is very like May’s mother’s voice but more vigorous and imperious. If the story is really autobiographical and not a fiction, we can see in retrospect how the two lives of mother and daughter run down from energy to impotence to nothingness. ecorded voice of “V” (in fact, W’s own voice) describing in fragments what W is doing, rocking by a window, her only window, looking out on “other only windows”. W joins in with V’s speech for certain key phrases such as “time she stopped” or “rock her off”, but the word “More” is the only one she speaks on her own. In Waiting for Godot (1953), Pozzo remarks, “They give birth astride of a grave, the light gleams an instant, then it's night once more”. In Rockaby, Beckett suggests the process is not all that quick. From the title, the two-beat verse form of the speech fragments and from the rocking, it is clear that Beckett is presenting us with the image of a human being in the last stages of being rocked to sleep, or death, a process that began in infancy and will be repeated by W’s own daughter. As V, Dwan brings out a wide variety of tones in the verse – lulling, hypnotic, regretful, resigned. It’s quite beautiful, but we wonder when W will finally obey her inner voice that tells her “time she stopped”. Dwan’s performance makes this the most moving of the three plays and makes us feel this is one of the most moving of Beckett’s works. For fans of Beckett and of 20th-century drama in general, Dwan’s performance will likely be the closest any of us will come to experiencing definitive performances of any of these three works. We may disagree with the goal of speed in Not I, for if Beckett was satisfied with Billie Whitelaw’s timing why should Dwan try to shorten it? Nevertheless, it is definitely an unusual feat that must be heard to be believed which contrasts greatly with the sensitivity she reveals in Footfalls and Rockaby. Indeed, these last two are performed so beautifully that they alone justify a visit to he “Beckett Trilogy”. Photos: (from top) Lisa Dwan as Mouth in Not I, ©2014 Justin Downing. 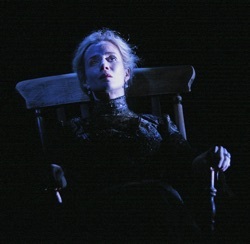 Lisa Dwan in Footfalls; Lisa Dwan in Rockaby. ©2014 John Haynes.